I like this poem because I can read it upside down and back and forth. The author has erased the beginning of the book, so there is no need to start reading it from page 1, I can choose the middle, “This is a pleasure! Your voice here"; or read it from bottom to top, starting in the image of a fabric with a heart towards "paradise is invaded". Seeing it erased is perhaps the oddest thing in the poem. 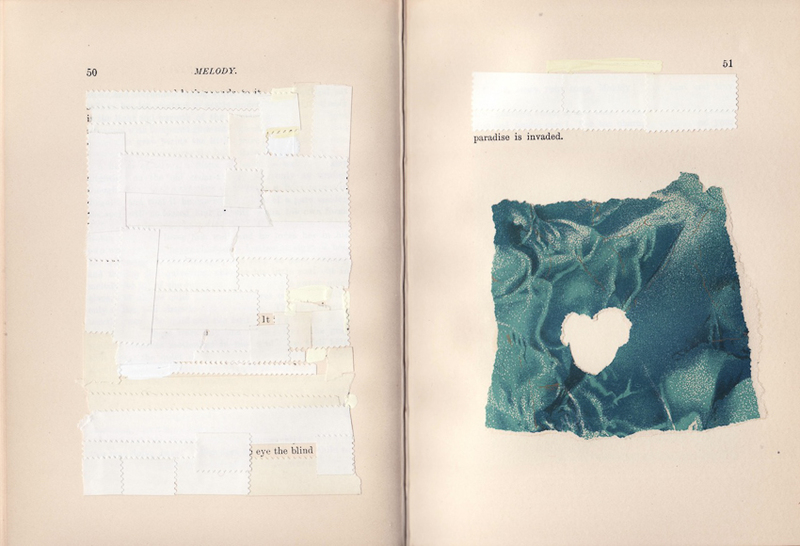 Large patches of erased text are blended with fragments of sentences – that escaped – and pieces of images that seem glued to each other, like might happen in a travel journal. More than words aligned, the poem is an image – an image of oblivion and resilience – which is endowed with surface and depth. And it reminds us that erasing can also be a tribute to persistence (like de Kooning’s drawing, which was erased by Rauschenberg), it is an invitation to plunge into a potential space. While waiting I can also read in the breaks, in the blank gaps that mediate the search for the meaning which, as usual, the eyes pursuit: the eyes search for a solid, reasonable meaning and see the word as salvation. But after all, the blank gaps are where everything that matters and everything there is to know. They make us slow down, they allow the existence of a volume of silence between me and the pages, which leaves me alone with my thoughts and intuitions. I return to the beginning of the book because, after all, it's hard to escape from the place where things start, from the original impact that we usually confuse with Love. And the poem begins by: "poetry. What is. It". Marta Cordeiro is an assistant professor at the Lisbon Theatre and Film School, Polytechnic Institute of Lisbon. She used to recite it for fun, and for any kind of reward.